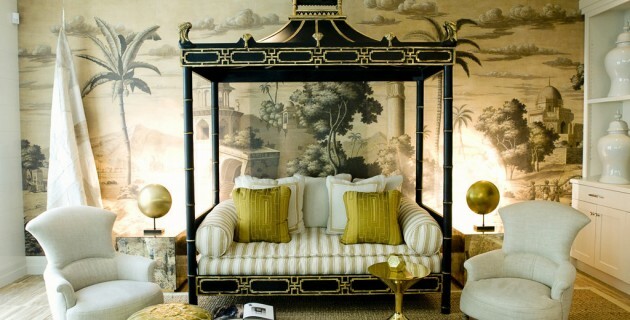 I DO LOVE A FAIR AMOUNT OF CHINOISERIE IN INTERIOR DESIGN! THIS IS SUCH A FANCY FEMININE STYLE THAT IT IS HARD NOT TO LOOK AT THE GORGEOUS PICS ON PINTEREST AND DROOL OVER THE PATTERNS! This enchanting wallpaper makes this room into an elegant space with oriental style. The Chinoiserie wallpaper in muted lilac, white, and gray hues coordinate with the white panelled high ceiling, furnishings, and light fixture to create a space with warmth. The patterned pillows with traditional Chinese prints are mixed in well with the modern furniture. 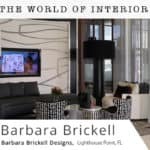 This room is so gorgeous I want to move right in and make myself comfortable on that curved sofa! 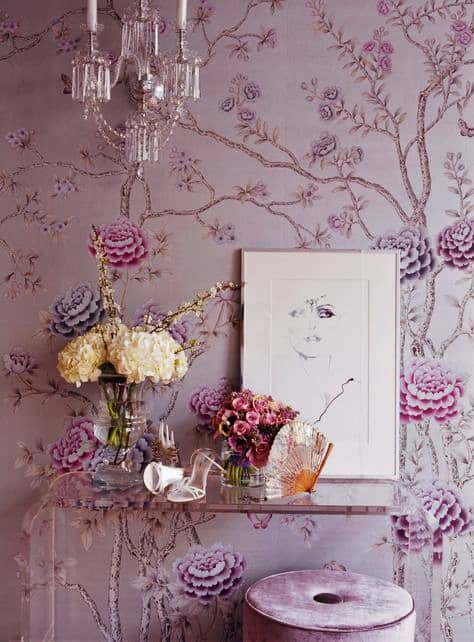 This classic Chinoiserie wallpaper has been given a modern look with delicate illustrations on a lilac background. The lavender colored velvet chair coordinates perfectly with the wallpaper and home decor accessories to make this clear vanity table into a gorgeous setting. I would love to have this table in my home with beautifully placed objects and fresh flowers. 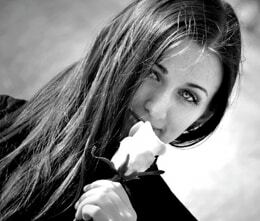 I think the jaw-dropping beauty of it all would be sure to make me very happy everyday! 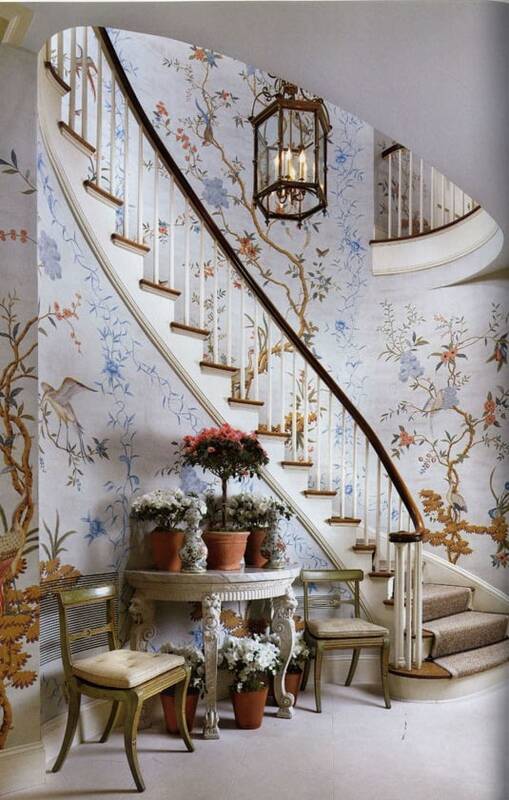 The lightly colored Chinoiserie wallpaper and white carpet create a calm palette in this chic and refined entry way. The beautiful, fresh flowers that sit on top of the ornately carved table create a lovely welcome into this gorgeous home. I would love to be so bold with a heavily patterned wallpaper; the effect it has is so amazing. I could imagine you would feel so stylish walking down those stairs everyday! 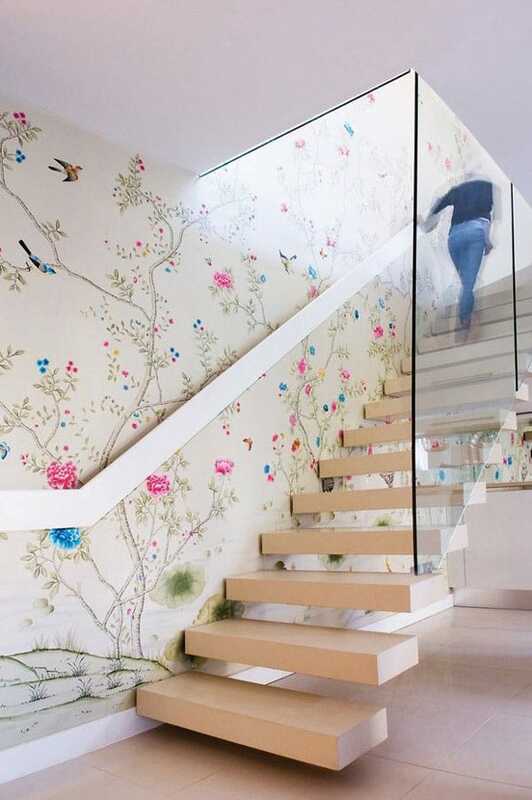 A modern staircase is given character with the addition of this bright Chinoiserie wallpaper. The bright colors of the flowers in the wallpaper contrast well with the neutral color palette of the stairs and flooring. This staircase makes a great feature in the home, with clean lines and the glass panelling, a fabulous talking point for family and guests! The exquisite detail of the Chinoiserie wallpaper has been coordinated so well with the oriental style furniture and decor accessories. The plush, green velvet chair paired with the lilac sofa give an idea of old world luxury. The silk covered lamp with an ornate base is such a perfect fit into this room. The decorative feeling is very beautiful and the wallpaper almost looks handpainted, which a lot of the original designs were. I would love to have something like this on my living room wall but would mix it with more modern furniture (IKEA’s best!). WHAT DO YOU THINK ABOUT THE DECORATIVE WALLPAPER? 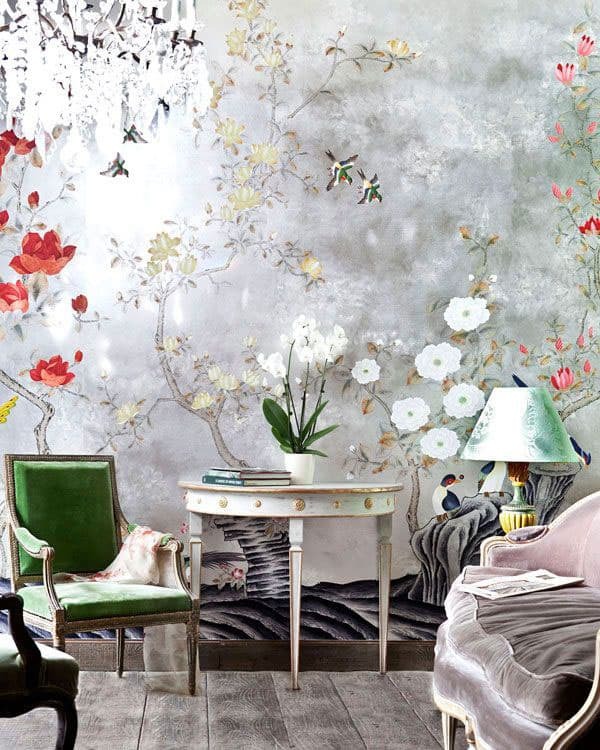 WOULD YOU HAVE THE CHINOISERIE STYLE IN YOUR HOME? ⇐ Go Tropical With Fresh Prints!